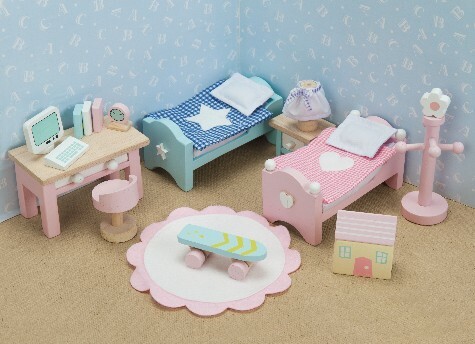 Handpainted Wood Dollhouse Furniture - The Daisylane Bathroom set includes two single beds with bedding, desk with computer & chair, toy skateboard, miniature dollhouse & accessories, rug, nightstand, and lamp. 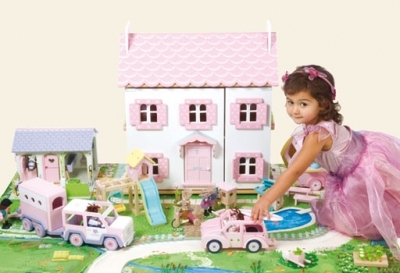 Your little girl will love this handpainted wooden dollhouse furniture. She can decorate each room of her dollhouse with furniture and accessories just like she sees Mommy do at home. Watch her imagination grow through creative play.